The Demic Atlas rests on the proposition that socio-economic comparisons work best when based on comparable units, framed at approximately the same scale of analysis. The obscure term demic—“pertaining to populations of people”—highlights the demographic egalitarianism central to the project. 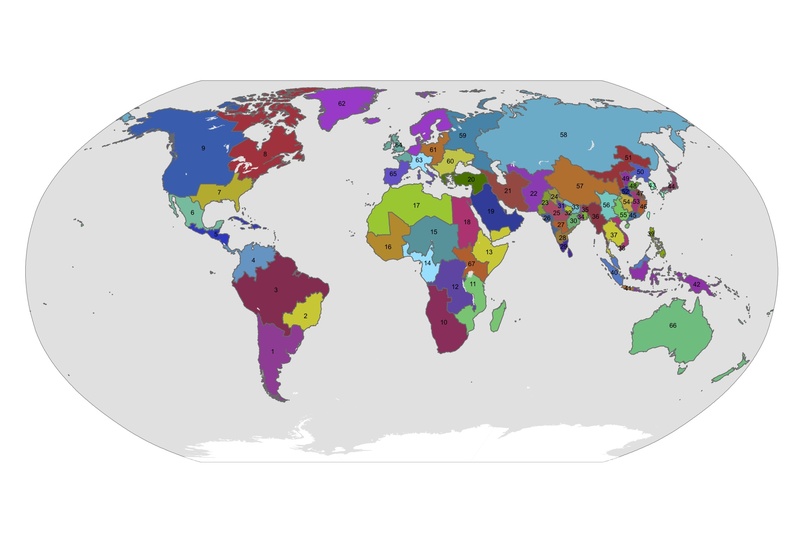 Ideally, regions of equal population should be compared against each other; otherwise, the individual inhabitants of some parts of the world are weighed more heavily than those of other areas. Conventional comparisons based on sovereign states necessarily violate this principle, effectively giving the residents of small countries far more attention than their counterparts in big, densely populated states. The premise of the Demic Atlas is that deploying roughly comparable categories will yield a more illuminating picture of global development. The first step in this project has been to create an alternative base-map: one in which all units have similar numbers of inhabitants. After much experimentation, we have settled on 67 regions of roughly 100 million persons each. This is admittedly a rough grid; only eleven sovereign states have more than 100 million inhabitants. A smaller target figure of fifty or even twenty-five million might have been desirable, but such an option was precluded by data limitations (as explored below) as well as design difficulties. (Across East and South Asia, doubling the number of units would have cluttered the map and made it difficult to read without magnification). As it stands, we are persuaded that the 100-million norm, crude though it may be, is an improvement over customary global maps. A signal advantage is the ability to highlight internal diversity within the world’s demographic giants (India and China), and contrast these with zonal patterns in the Americas or Africa in a single global snapshot. The data difficulties that stand in the way of creating smaller demic regions stem from the need to rely on conventional categories even while trying to transcend them. Literally as well as figuratively, sovereign states are the units that count; these are the bodies that conduct censuses and gather most data. It is no coincidence that the term “statistics” derives from the Latin for “of the state.” When international agencies such as the World Bank and the International Monetary Fund (IMF) tabulate country data, they steadfastly ignore sub-national divisions, no matter how large or important internal regions may be. Nor is this always a bad strategy. For while most countries collect information on their own subdivisions, they do so in diverse ways. For instance, GDP figures are available for the states of India, the provinces of China, the prefectures of Japan, and so on, but such information is usually gathered in different years by different countries, and is seldom fully comparable. For a number of the poorest countries, usable socio-economic information at the provincial level is simply unavailable. A non-state-based appraisal of global socio-economic development must therefore use states and their major subdivisions as the building blocks of an alternative scheme. Middling, small, and tiny countries have to be grouped together to form units of a more appropriate size. By the same token, large countries need to be broken down into their provinces or prefectures, which can then be selectively re-aggregated to form units approaching the target population. These two methods alone, however, do not always yield regions of approximately 100 million inhabitants. Consider the situation in North America. The United States, with a little more than 300 million people, could be easily split into three demic regions in the target range. But Canada, with 34 million inhabitants, is far too small to constitute such a region on its own, yet it has no neighbors with which it can be joined other than the United States. Unless one were to create an ocean-spanning region linking Canada to northwestern Europe, Canada has to be combined—whether as a whole or in parts—with some cluster of U.S. states. Similar challenges arise in other parts of the world as well, where the shape and distribution of landmasses and archipelagos is such that the only way to create units in the target range is by splitting and merging countries in highly unorthodox ways. Such an exercise demands tedious data manipulations, but we are convinced that it proves useful for depicting places in which developmental gradients are deeply out of sync with the geopolitical framework. It also helps to unsettle the notion that countries form natural units of observation, one of the overriding goals of the larger project. Such maneuvers, however, still prove inadequate to the task of generating units of an appropriate scale across the world. On the one hand, several Indian states and one Chinese province in themselves exceed the 100-million guideline. Most are close enough to the target number that they could be mapped as demic regions in their own right. But Uttar Pradesh—the world’s largest “statoid” (as first-order subdivisions of sovereign states are sometimes called)—has nearly 200 million inhabitants. By the logic of our project, a unit of this size needs to be divided. Likewise, to create a grid of geographically contiguous blocks of roughly 100 million inhabitants across India, two other Indian states were split and re-aggregated at the district level. (In our model, Western Maharashtra has been paired with Gujarat, eastern Maharashtra joined with northwestern Andhra Pradesh [Telangana], and the rest of Andhra Pradesh connected with Karnataka.) This time-consuming procedure, however, proved in the end to be of marginal statistical utility, as comparable socio-economic data for Indian districts was not obtained. Other issues, too, complicated the drive to delineate areas of 100 million inhabitants. One was the design desideratum for our regions to be spatially compact. Although it would have been easier in some areas of the world to reach the target population by devising irregularly shaped regions, such a procedure would have resulted in a fair amount of gerrymandering. Even in the best of circumstances, the underlying geopolitical substrate frustrates the attempt to craft truly compact regions. Many countries have aberrant shapes; the odd outline of Cameroon, for example, contributes to an oddly shaped Region 14 in the demic base-map. Exclaves can be even more problematic, since outliers that fragment the territorial cohesion of individual countries can do the same for the regions to which those countries are assigned. Ideally, exclaves are placed within the spatially appropriate demic regions; Russia’s Baltic exclave of Kaliningrad, for example, is classified in Region 61, rather than in western-Russia-focused Region 59. By the same token, Angola’s exclave of Cabinda should have been placed in Region 14, rather than with the rest of Angola in Region 10. Doing so, however, would have required breaking Angola down into its constituent provinces, a procedure too time-consuming for the current iteration of the Demic Atlas. A third divisional principle was that, in addition to being spatially compact, demic regions should be characterized by roughly similar levels of socio-economic development. Average figures for a region split into between a wealthy, highly educated area and an impoverished, poorly educated area would tell us little about the region as a whole. Clumping countries and their subdivisions into reasonably coherent developmental regions is possible, as levels of socio-economic development across the world tend to be highly geographically structured. But perfect aggregation of this sort is again impossible. In some parts of the world, areas of extremely high and extremely low developmental standing are spatially interspersed. The Caribbean is particularly diverse on this score, containing both very wealthy areas (Cayman Islands) and very poor ones (Haiti). Since the prosperous parts of the Caribbean are demographically overshadowed by the region’s poorer zones, the region as a whole shows relatively low levels of development. Archipelagic environments like the Caribbean pose yet another challenge to the regionalization scheme. The guideline of spatially compactness would seemingly rule out maritime-centered regions linking the opposing shores of intervening water-bodies. But the world’s only islands populous enough to stand on their own are Indonesia’s Java and Japan’s Honshu; all others must be grouped with other islands or, more often, with nearby peninsulas. As a result, several sea-focused regions do appear on the map, such as Region 65. The criterion of socio-economic similarity generates further compromises along these lines, as certain islands are in developmental terms best grouped not with their closest mainland neighbors but rather with more distant islands and shores. Region 43, composed of Taiwan, South Korea, and Japan’s Kyushu, Shikoku, and Ryukyu Archipelago, is particularly problematic in this manner. By the principle of spatial compactness, South Korea would have been much better grouped with North Korea and a segment of northeastern China, while Taiwan would have fit better with Fujian in mainland China. Such a maneuver, hoverer, was rejected, as it would have required uniting highly divergent economies. Hong Kong and Macao, however, were grouped with the Chinese province of Guangdong, even though socio-economic considerations would have called for them to be put in the same category as Taiwan and South Korea. In this case, the spatial irregularity that would have resulted was deemed excessive. One part of the world that stubbornly resisted our regionalization guidelines to the last was Australia and environs. By the principle of compactness, Australia can only be joined to eastern Indonesia; any other scheme would require spanning vast stretches of sea-space. But the Austral lands resist regionalization with Java and the Lesser Sunda Islands, as the developmental gap between them is too large. In the end, since Australia and New Zealand lack sizable neighbors with similar socio-economic conditions, they have been granted the status of a region in their own right, along with most of the rest of Oceania. But considering its meager population, Region 66 is best considered a quarter-region. As is often the case, Australia is revealed to be a most distinctive land. The demic base-map is thus a product of many agonizing trade-offs, in which the criteria of population, shape, and socio-economic standing had to be constantly weighed against each other. The map consequently went through a number of changes over the course of its construction. Region 10, for example, was originally much larger, including Zimbabwe and Mozambique, as the population of the six countries currently constituting the region was judged inadequate. But linking Zimbabwe and Mozambique, two of the world’s least developed countries, with sub-Saharan Africa’s otherwise most highly developed region seemed unfair. In the end, an additional region was carved out of eastern Africa, resulting in the out-of-order numbering scheme currently found on the map. In Brazil, the state of Mato Grosso was originally slotted on socio-economic grounds with Region 2, while Bahia was placed in Region 3 on the same grounds; the resulting Region 3, however, was deemed too irregular, while the population of Region 2 was considered too small. The resulting division of the world is thus not merely idiosyncratic, but is replete with vexing compromises. Criticisms and suggestions are welcome; the map remains open to change. The GIS files by which it was constructed will eventually be posted online, allowing others to build their own alternatives to the state-based global framework. If our future plans come to fruition, other sizable countries will also be broken down into their first-order subdivisions, which would allow more complex regionalization schemes. Finally, let us stress that the demic regions outlined here are strictly intended as a framework for socio-economic comparison. Having no cultural, political, or historical significance, they are completely useless for (and could cause grave mischief in) many geographical questions. It is our hope that the construction of culturally and historically based alternatives to the standard geopolitical framework will also someday be advanced, but that is not the goal of the Demic Atlas. The next few posts will consider the sixty-seven (or sixty-six and a quarter) demic regions in more detail. Next week, socio-economic maps using the scheme will begin to appear on GeoCurrents.